Our company is one of the top-most companies that offer a wide range of Swimming Pools Construction Services to meet the demands of customers. These services are well planned by experts and are highly appreciated by our customers. Our services are provided either for leisure or sport purposes. A team of skilled workers construct swimming pools. 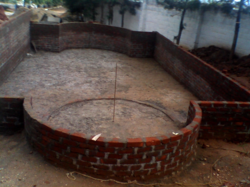 The first step in the construction of swimming pools is the earth work. 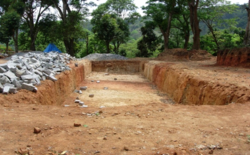 In this step, the earth is dug up initially for constructing the pool. Our company is one of the top-most companies that offer a wide range of Swimming Pools Construction Services to meet the demands of customers. These services are well planned by experts and are highly appreciated by our customers. Our services are provided either for leisure or sport purposes. 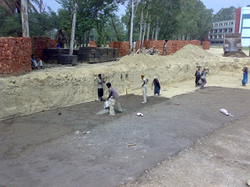 A team of skilled workers construct swimming pools. We provide turnkey solutions to customers. Some of the onsite pool construction pictures has been provided for reference. We also offer swimming pools made up of bricks. A picture has been attached of the same, for our clients to see. 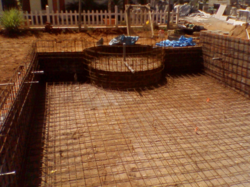 We also construct swimming pools from Steel Reinforcement Process. 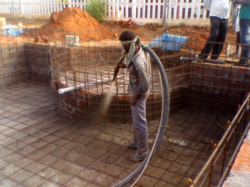 Here instead of cement, steel reinforcement is done to construct swimming pools. 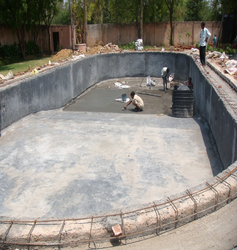 We also offer the swimming pool construction in the shotcreting work. This is another method for constructing swimming pools. The process of shotcreting (rock bolt support) consists of the following stages: preparation of underground working space surface, installation and assembling of support elements (anchors, arches, expanded lath), cover lamination, cover protection, quality management. We also offer swimming pool construction through plastering work also. This involves a wide range of tasks for leveling the surface and preparing it for further finishing (puttying, papering the walls, painting).